You no doubt remember when your tennis or athletic court was brand new and perfectly smooth. 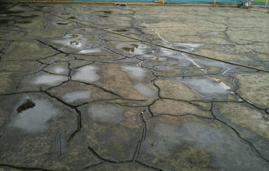 However, over time, an asphalt court can crack and start to look ugly. Not to mention, an uneven court surface could adversely affect your game. No matter what type of wear and tear, or cracking your athletic court is showing, we’ve got the right experience and tools as well as supplies to solve the problem. All Court Hawaii offers the Guardian® Crack Repair System for surfaces in an advanced state of disrepair. Guardian® is the innovator of “peel and seal” repair systems, which adhere to your existing court base, providing superior flexibility and durability. This system prevents water from entering the crack and causing further deterioration by combining a flexible fabric with an ultra-aggressive adhesive. Guardian® has proven effective in all temperature ranges. Plus it increases the longevity of your courts and surfaces. All Court Hawaii also installs PREMIER COURT®, a patented recreational surface system that offers an alternative to expensive crack repairs and total pavement replacement of cracked tennis courts. These courts overlay the entire surface and protect the existing asphalt from further rapid deterioration. PREMIER COURT® offers world-class shock-absorbency without the maintenance costs associated with traditional soft courts, making them your best bet for long-lasting, professional courts. Additionally, each PREMIER COURT® installation has a 25-year industry leading warranty at no additional cost. Stripping your court before resurfacing it becomes necessary if the acrylic surface of the court is delaminating from the original asphalt slab and is essential for the longevity of the new court. To strip a court is to remove entirely any trace of the previous surfacing material; so, in the case of a tennis court, stripping would remove the material that defines the court, leaving only the hard court (asphalt or concrete) beneath. Stripping a court allows any discrepancies to be repaired before laying a new surface, which allows the new acrylic coating to adhere properly and on the best foundation possible. All Court inspects every court before surfacing and recommends the appropriate solution. 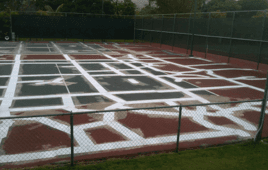 Even if your tennis or athletic court seems cracked beyond repair, All Court Hawaii can help. 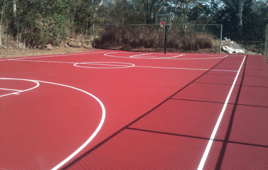 Call us today at 808-283-1147 to discover all the ways we can revive your old sports court and bring it back to life.